On my trip to Broken Hill in January 2012, I attended the opening night of a photographic exhibition by the controversial photographer Bill Henson, at the Broken Hill Regional Art Gallery. It was there that I met a gentleman called John. I told him about my www.ilovebrokenhill.com site, and he proceeded to tell me about the surprising connection between Broken Hill and the famous RMS (Royal Mail Ship/Steamer) Titanic. 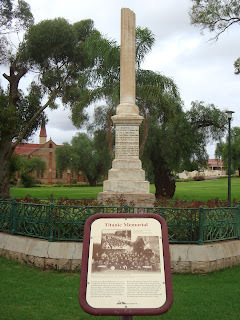 There is a memorial for the Titanic in Sturt Park, Broken Hill. The memorial, in the form of a ‘broken column’ monument, was the “brainchild” of the Broken Hill City Bandsmen and was completed in late 1913, the year following the sinking on 15 April 1912, of the luxury ocean steam ship whilst on her maiden voyage. Of the 2,201 passengers (approximately) and crew, 1,490 people drowned. The column monument (pictured) is broken off at the top, according to Broken Hill volunteer guide Jack Harris, “because it’s a symbol of an old Greek mythology that you didn’t accomplish everything that you set out to do in life and so your life was snapped off”. 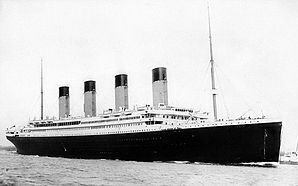 In an interview with ABC’s Guy Noble’s on the “Dimensions in Time” program, on 15 April 2002, to mark the 90th anniversary of the Titanic’s sinking, Jack noted that “1913 was the worst year ever on the mines” with “31 killed on the mines”. Just as the mine deaths should not have happened, so too the drowning deaths should not have happened. This fact was also part of the inspiration for the memorial. April 15, 2012 is the 100th anniversary of the Titanic sinking, and the event is being marked worldwide with various ceremonies. In Broken Hill, there will be a special service held at 12.30pm on Sunday 15 April 2012 at the memorial in Sturt Park (corner of Sulphide and Wolfram Streets). The service will include prayers and the story behind the monument. The Barrier Industrial Unions’ (BIU) (brass) Band (formerly the Broken Hill City Band) will also perform. Everyone is welcome to attend. The connection of the BIU band to the Titanic is that it was reported that as the ship was sinking, the ship’s band played music to help calm the passengers. Notably “Nearer My God to Thee”, was played/sung close to the end, as members of the band, and about two thirds of the passengers ultimately drowned in the icy waters of the North Atlantic Ocean. Let us hope there is never another sinking of any ship causing loss of life. If you have a personal story regarding the RMS Titanic or the Broken Hill Memorial please feel free to share your thoughts.